Listen on Stitcher, iTunes, Google Podcasts, Spotify and YouTube. Ep.23: Fall Weeding Tips & Effortless Leaf Clean UP! DIY Garden Minute Ep. 8: Fall Mulching, Defined. DIY Garden Minute Ep. 7: Mulch Basics Explained! Best Pruning Saw For Any Gardener! The Versatile Garden Tool! Best Pruning Shears for Any Gardener! The Must-Have Garden Tool! DIY Garden Minute Ep. 5: Pruning Shears vs Loppers- What is the Difference? DIY Garden Minute Ep. 2: Pruning vs Dead-Heading Revealed! DIY Garden Minute Ep. 15: Fall Bulb Planting, Explained! DIY Garden Minute Ep. 6: Fall Perennial Planting Tips, Demystified! DIY Garden Minute Ep 4: To Divide or Not To Divide, Explained! DIY Garden Minute Ep. 14: Weeding- The Disruption Strategy! Ep. 21: Proactive Weed Control Strategies For Any Season! How To Build Your Very First Raised Garden Bed in Time For Spring Planting! Ep19 Vegetable Gardening Part 2 – How Can You Place and Build a DIY Raised Garden Bed? 7 DIY Ideas For Awesome Outdoor Entertaining In Any Season! How To Attract Pollinators To Your Garden Like A Boss! Top 5 Best Pollinators You Should Attract To Your Garden Right Now! Ep. 20: How To Design and Build Your Own Pollinator Garden For Any Season! Best Garden Tool Sets: The Perfect Holiday Gift For Those Gardeners In Your Life! How To Mulch Anytime of Year! Everyone gives roses on Valentine’s Day. But not you. You are different. You want to give a unique, memorable gift for that loved one in your life because unexpected gifts are the best kind of gifts. The hardest part will be picking just one gift from our list below (we managed to fall in love with this one really unique gift). In our “Unique Valentine’s Day Gift Ideas for Gardeners,” podcast and show notes below, we’ll present 5 unique and unexpected garden gifts. This episode is meant for anyone looking for garden-related gift ideas for Valentine’s Day (or any other day, really). Are you ready to do some shopping for the garden lover in your life?? Below you will find everything from succulents to trees to seeds. There are so many unique ideas out there, however, we felt that these 5 unexpected gift options are perfect for you to choose from. The best part is the prices are GREAT right now and most of the items have Prime shipping! These seeds are perfect for your gardening loved one who loves flowers and wants to help the pollinators. We love this seed packet (and company) because all of the seeds are sourced from open-pollinated plants. This packet is full of different colored flowers, like Black-Eyed Susan, Purple Cone Flower, Columbine, White Yarrow, Dianthus, and more! This is a great gift to show your loved one that you care about them so much you want them to have cleaner indoor air, a more positive attitude, and even help keep them calm with a sense of having the outdoors indoors! The Heart-Shaped Leaf Philodendron is a REALLY easy plant to care for needing only indirect light, some water, and very little maintenance otherwise. And look at those heart-shaped leaves!! Under the right indoor conditions, this gift will continue to grow new heart-shaped leaves symbolizing all the love and affection you have for your loved one for years to come! Life would “succ” without this unique gift idea! We instantly fell in love with this unique plant because it is a perfect alternative to cut flowers. Costa Farms produces this one of a kind heart-shaped succulent-like plant. Even after the Valentine’s Day holiday is over, the recipient of this gift can keep this heart-shaped plant as a reminder of your love and affection the rest of the year. We guarantee you never thought of gifting a citrus tree for Valentine’s day!! By gifting your loved one a lemon tree they could eventually grow and pick their own actual lemons. Isn’t that great?! Just like your relationship with your loved one, with care and special attention, this tree can mature over time to produce fruit you could both can enjoy. This tree we are promoting is a Meyer Lemon Tree fully certified from Hirts’ Garden. It loves full sun and can remain outside in temperatures above 40-degrees F.
This lemon tree produces the sweetest of all lemons and is great as an indoor or outdoor plant. (Unfortunately, since it is live citrus, it cannot be shipped to Arizona, California, Florida, Hawaii, Louisiana, Puerto Rico, Texas, Virgin Islands as per USDA Regulations). This super unique gift has many different options for uses including the choice of displaying it inside your home or outside in your garden. This multi-purpose gift can be used as both a living centerpiece for any table, hung on a wall, or displayed near a garden. It’s hand-made and fresh to order. The succulent plants are very low maintenance and easy to care for. So many different ways to use and express your love to someone! The possibilities are endless for creative, unique ways to express your love. With our 5 unexpected gift ideas above (including our favorite), you can hopefully find that perfect present. Why buy roses or cut flowers, when you can show how thoughtful you are with your unique Valentine’s Day gift! That’s all for this podcast episode! Get ready for Spring with our free garden shopping list! Also, as a reminder, you find us on your favorite podcast platform and now Alexa through MyPod or AnyPod! Receive your FREE spring shopping list after subscribing to our Spoken Garden community so you can start planning for spring now! Included in the cheat sheet for you: A list of spring tools, garden supplies, veggie seeds, starter plants plus links to buy our recommended products. Success! Now check your email to get your free download and confirm your subscription. **And, thank you for trusting us with your email for future garden-related communication. We take our partnerships very seriously. And hey—before you head out—if you want to connect with us and subscribe to our newsletter go to Spoken Garden’s free resource page! We have FREE garden content we are so excited to give to you, like cheat sheets, plant profile sheets, etc! See you there! Share our show on Twitter, Facebook, or Pinterest. Leave a review on iTunes. Your ratings and reviews really help us out! Subscribe on iTunes or Spotify. 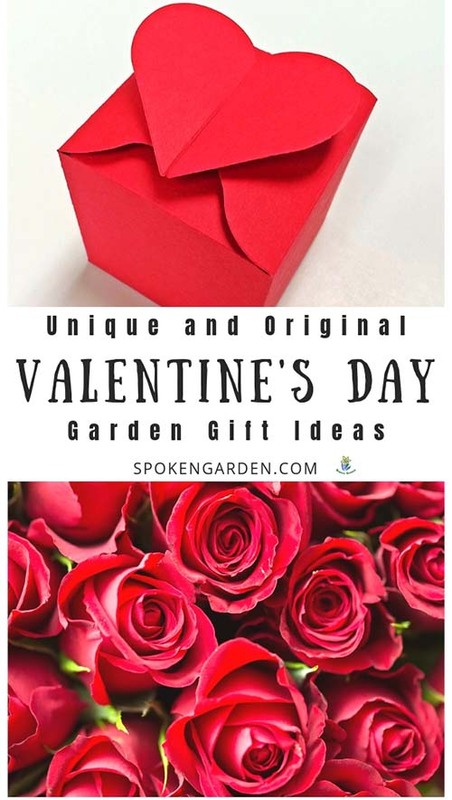 Click the graphic above to save “Unique Valentine’s Day Gift Ideas For Gardeners” to Pinterest for later! *Spoken Garden is a participant in the Amazon Services LLC Associates Program, an affiliate advertising program designed to provide a means for sites to earn advertising fees by advertising and linking to Amazon.com. Learn about 5 unique and totally unexpected gift ideas for those gardeners in your life! Roses Plant Profile Cheat Sheet in our free resource library. Unique, unexpected ideas for garden-related Valentine’s Day gifts. 5 Valentine’s Day presents to make this a special, memorable holiday. Some of the resources and products below may be affiliate links, meaning we might get paid a commission (at no extra cost to you) if you use that link to make a purchase. Best Pruning Shears For Any Gardener!